Vancouver bloggers The Food Gays just gave our number one comfort food a new fall vibe. At this point, we’re used to pumpkin popping up in every recipe imaginable as soon as fall hits. But this year, a dish from the new cookbook Cooking in Color by Vancouver food bloggers Adrian Harris and Jeremy Inglett is turning our attention to another member of the gourd family. 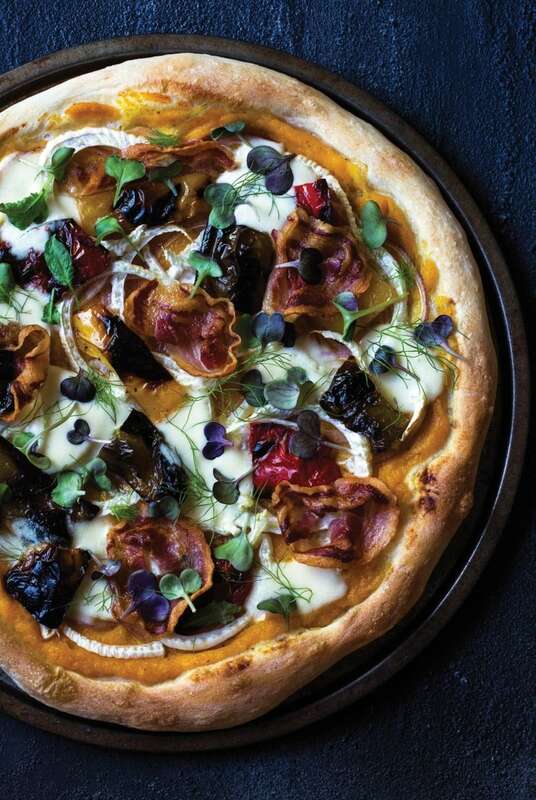 Topped with grilled peppers, pancetta and a butternut squash sauce, this surreptitiously veg-forward pie will give your next pizza night the autumnal edge it never knew it wanted. And while you can certainly go the from-scratch route using Adrian and Jeremy’s recipe for ‘perfect’ dough, this ‘za will taste great on a store-bought crust if you’re short on time, too. Butternut squash is one of those vegetables that is often overlooked but is actually a very versatile ingredient. In the past, we’ve used it in everything from mac 'n' cheese to a tart filling. But we prefer it this way: as a creamy, luscious base for this delectable winter-inspired pizza. In the bowl of a stand mixer, combine water, 1 tsp sugar and the active dry yeast. Let stand for 10 minutes, or until the water is foamy and yeast is activated. Meanwhile, in a separate medium bowl, whisk together flour, salt and remaining 1 tsp sugar. Add to bowl with yeast. Using the dough hook attachment, mix on medium speed for 10 minutes, or until a pliable dough ball forms and the sides of the mixer are clean. Remove dough and coat bowl with a little oil. Return dough to the oiled bowl, cover with a clean kitchen towel and let rise in a warm, draft-free place until doubled in size, about 1 hour. Punch down the dough and divide into two equal portions. Shape each portion into a small ball. Let dough rest, covered, for 10 minutes before stretching out and covering with your favourite toppings. In a small bowl, combine sea salt with chosen flavoured ingredients. Using your hands, massage together until well incorporated. Spread evenly on a baking sheet and let air-dry for 2 to 3 hours. Alternatively, bake in a preheated 200°F oven for 15 to 20 minutes; let cool completely before transferring to an airtight jar. Keeps in a cool, dry place for up to 12 months. Tip: To make porcini mushroom powder, simply place dried porcini mushrooms in a blender or food processor and blend to a fine powder. Add to everything from rice to soup to sauces for an extra boost of flavor. Store in an airtight container in a cool, dry place. Make purée: Preheat oven to 400°F. Line a baking sheet with parchment paper. Score the flesh of the butternut squash and drizzle with olive oil. Sprinkle with herbed salt. Tuck a garlic clove inside each squash half and place cut-side down on the prepared baking sheet. Bake in preheated oven for 30 minutes, or until fork-tender. Remove from oven and let cool at room temperature for 5 to 10 minutes. Using a large spoon, carefully scoop out the cooked squash and garlic and transfer to a food processor. Blend until completely smooth. Set aside until needed. Grill peppers: Heat your barbecue or grill pan to medium-high. Grill bell peppers on all sides until they’re nice and charred. Transfer to a cutting board and cut into large pieces, discarding seeds and veins. Set aside. Assemble pizza: Preheat oven to 450°F. Grease a pizza pan or baking sheet and set aside. Stretch dough out to desired pizza-base size and place on prepared pan. Spread the butternut squash purée over the dough, leaving room around the edge for the crust. Top with charred bell peppers, sliced fennel and pancetta. Bake in preheated oven for 15 to 20 minutes, until the crust is golden and crispy. Remove the pan from oven and top pizza with torn chunks of fior di latte. Bake for another 2 to 3 minutes, until cheese is melted. Remove from oven and top with microgreens (if using) and fennel fronds. Let cool for 1 to 2 minutes before serving.